Bhutan is a kingdom in eastern Himalays. 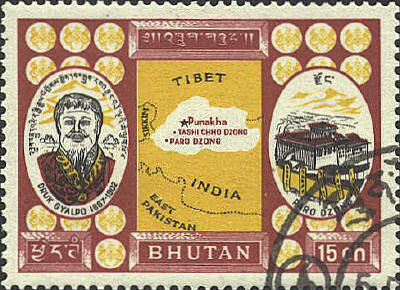 The stamp was issued in 1962. It shows pictures of Druk Gyalpo (the dragon king) Ugyen Wangchuk (1867-1902), and the Paro Dzong . A Dzong is a fortress-monastery which at Paro provides the site for the local government. It was first built in 1646, and has been rebuilt several times. In 1907 Bhutan was an absolute monarchy, but today has moved toward being a constitutional monarchy.